The Media and Broadcasting industry is undergoing dramatic changes in technology and business models. To stay competitive, you need flexibility in your video delivery infrastructure so you can go in whatever direction is required to satisfy and hold onto an audience. The Limelight Solution for Media and Broadcasters provides the tools you’ll need to manage and deliver live and on demand video with the best possible user experience to a global audience. 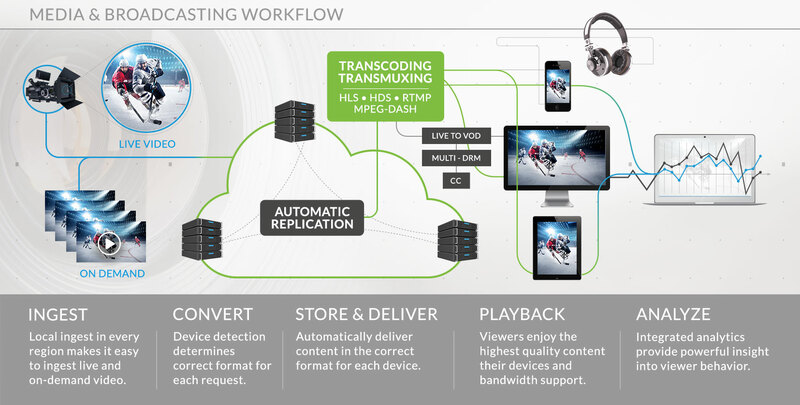 Flexible video ingest format options and cloud-based transcoding and transmuxing, offloads complex tasks and ensures delivery of the correct format to every device. Reduce video file storage requirements by converting files at time of request and delivering directly to the user. Leverage our cloud resources for content origin storage and CDN delivery to reduce your infrastructure investment. Protect your media assets with a variety of security services available at global scale including SSL, Geo Fencing, Tokenization, and IP address list content access control, and website attack defenses through WAF and DDoS Attack Interceptor. Find out more about how the Limelight solution for Media and Broadcasters can help you deliver your media content cost effectively and flawlessly to audiences everywhere. The Limelight solution for Media and Broadcasters provides the capabilities needed for the next generation of video content delivery and consumption. Video management services incorporate the workflow components for live and on demand video—from format conversion, device detection, media file replication, content security, and playback with analytics. Using the Limelight Orchestrate Platform provides high capacity and global delivery with no infrastructure build-outs on your part. Our Live Video Technology Solution is backed by proven expertise and thousands of hours of experience delivering some of the world’s largest online events. From the Olympics to presidential inaugurations, Limelight’s operational staff has demonstrated the capabilities needed to ensure your streaming goes off without a problem, scales to meet demand, and provides the broadcast quality experience your audience demands.